George Briggs was an unassuming and conservative man. His skills as an experimental physicist had been attested to by no-one less that Ernest Rutherford, yet he was inclined to keep ‘in the background’.1 Despite this natural reticence, Briggs had ably led the Physics Section of CSIR’s National Standards Laboratory since its establishment in 1938, helping it to establish a reputation ‘as one of the major standards organizations in the world’. Briggs’s own research was aimed at obtaining precise measurements of some of the smallest physical quantities imaginable. His work on the determination of the energies of alpha particles emitted by radioactive substances was, according to Mark Oliphant, ‘of a different order of precision than any other’.2 His pursued this research with ‘real flair’ and was able to make precision measurements ‘really interesting and exciting’ to his colleagues.3 Nonetheless, this was hardly the sort of science that captured the public imagination. All the more strange then was this appearance – for here he was, George Briggs, physicist, about to give evidence in a spy trial. It was December 1954 and the Royal Commission on Espionage (the Petrov Commission) was well advanced in its investigations. Gone were the days of high drama when the Leader of the Opposition, H.V. Evatt, had clashed heatedly with the Commissioners over his allegations of a right-wing conspiracy. The Commission had settled down to a methodical examination of the documents that Vladimir Petrov had handed over upon his defection to ASIO. These documents gave names and brief details of certain individuals whom Soviet intelligence (the MVD) believed to be of potential value. As the Commission itself recognized, to be included in these lists was no evidence of wrong-doing, but still it did not hesitate to call many of those named before the enquiry, opening their private beliefs and associations to public scrutiny. ‘What was the title of it – the United Nations –?’ asked the Commission’s Chairman Mr Justice Owen. 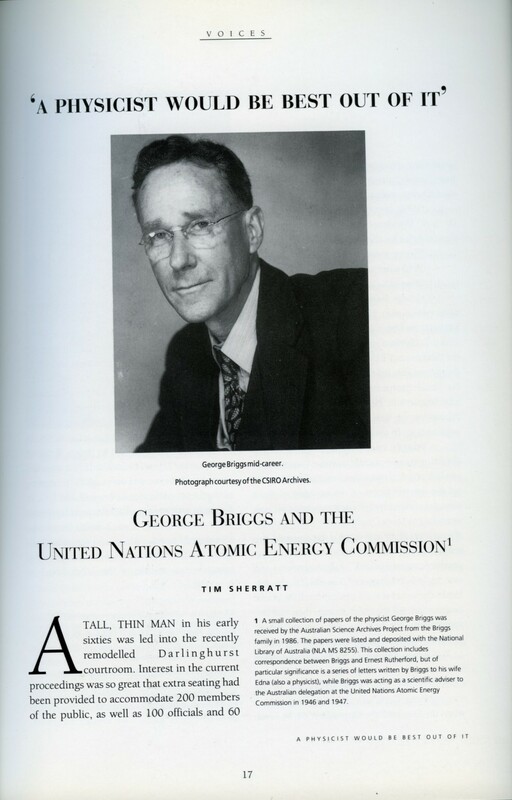 ‘Atomic Energy Commission’, answered Briggs. ‘For both peace and war?’ piped up Mr Justice Ligertwood. As George Briggs sat in the near-empty courtroom answering these facile questions he may well have wondered how different it could have been. If the mission that had taken him to New York had been successful – if some system for the international control had been hammered out – the course of the Cold War would have been radically different. Would there have been a Cold War at all? Where there had been hope for co-operation, plans for the free interchange of scientific information, there were now jealously guarded secrets, persecution and spy trials. Briggs was not an enthusiastic air traveller, but with a little nembutal to help him sleep, he arrived in London feeling well and ready for work.10 Here he met up with Evatt and also Mark Oliphant, who, like Briggs, was to provide the Australian delegation with scientific advice. Oliphant had closely followed Briggs as a research student at the Cavendish Laboratory under the direction of Rutherford. Hardly the retiring type, Oliphant had become widely known through his research in atomic physics as one of Australia’s most prominent scientists. Everything was happening so quickly. It was barely three weeks since Fred White, CSIR’s Chief Executive, had told Briggs that he had been nominated as the Council’s first choice to assist the Australian delegation at the atomic energy talks.12 He had had so little time to reflect on the nature of the task that lay ahead. How could he contribute? Although he was present as a scientific adviser, he had little knowledge of the wartime developments in atomic energy. How could he? Australia had not been made privy to the secrets of the Manhattan Project. It was Oliphant who had leaked the first news of the atomic bomb to the Australian government. Atomic energy seemed likely to offer great benefits to Australia, and CSIR was keen to undertake some sort of research programme, but first it needed information. By the end of May the Australian contingent had arrived in New York. There was no time to lose. The chairmanship, allocated alphabetically, provided the Australian delegation with a ‘special opportunity’ to set the UNAEC upon its urgent task.13 In the weeks before the first scheduled meeting, Briggs, Evatt and Oliphant set about developing their strategies. ‘Evatt wants to take a “strong line” – ie. no delay in arriving at decisions. Hence the need to get over here early’, Briggs wrote to Edna.14 He and Oliphant pored over the Acheson-Lilienthal report which, it was believed, would be the basis of US policy at the UNAEC. They found much to admire in the report, but were concerned about the effect that prolonging the US atomic monopoly might have on international relations. This point was emphasised in a statement the delegation prepared, outlining their policy towards the UNAEC. Any delay in the carrying out of the UNAEC’s work, it argued, would ‘aggravate existing tension between nations’ and ‘arouse the suspicions of the peoples of the world’.15 However, this was not simply a crusade to set the world to rights, for Australia was no disinterested do-gooder. The UNAEC provided both a ‘responsibility’ and an ‘opportunity’, for as soon as some system of control was established, Australia could expect to benefit from the free interchange of information on the peaceful uses of atomic energy. Both hope and fear propelled the Australians’ enthusiasm. The signs were not promising. The US had appointed elderly financier Bernard Baruch and his coterie of ‘Wall Street thugs’ as its representatives to the UNAEC.17 Russia was becoming increasingly suspicious of US intentions. What chance had Australia’s hopes for prompt action? A deadlock had developed with the rival plans put forward by the USA and the USSR opposed on a number of fundamental points. Whereas the Baruch Plan sought the establishment of a wide-ranging system of inspection and control as a first step in the banning of atomic weapons, the Russian alternative proposed that such weapons be outlawed immediately. The Americans were unwilling to give up their atomic monopoly until sufficient safeguards had been formulated to prevent the secret development of atomic weapons. The USSR did not want to open its laboratories and mines to outside inspection while their super-power adversary maintained such a decisive advantage. There seemed little room for negotiation. The logic seemed clear enough, but despite Evatt’s impatient, hard-driving efforts as chairman, it failed to draw out agreement. By the end of July, Australia’s term in the chair had passed and Evatt and Oliphant had left New York. Their best efforts having been thwarted, these two flamboyant idealists moved on to continue the struggle elsewhere. George Briggs, however, stayed on. His CSIR division was struggling to map out its postwar research priorities, and his family was being forced to deal with his extended absence, yet he remained, not just for a month or two, but until the end of the year. He continued to collect information of course, visiting various laboratories around North America, but this was only as his timetable at the UNAEC allowed. It was his work towards the control of atomic energy that consumed most of his time, energy and concern. He could not leave the job unfinished. It was not until 29 December that George Briggs flew out of New York. Six months! Six months away from his family, away from his laboratory. Who would have believed that this steady, painstaking scientist could have become so caught up in the hurly-burly of international politics. Back in June, Briggs and Oliphant had met with Australian Defence Force representatives in Washington to discuss the atomic energy situation. Reporting to his superiors, the RAAF representative described Oliphant as a ‘brilliant man who has a great perception of the responsibilities of the scientists and the requirements of the Services’. This was in contrast to Briggs, who presented ‘a narrow view’.28 Yet it was Briggs who sacrificed his scientific work because he believed he could make a worthwhile contribution to the UNAEC. There are different kinds of idealism. At various points during the year, Briggs had hoped that another scientist from Australia might be able to take his place. ‘They should be good committee men, able to present their views on the scientific aspect of the problem’, he recommended.29 Briggs’s ability to work as part of team was an important factor in his appointment to the National Standards Laboratory. It also proved valuable at the UNAEC, where political tensions made committee work frustrating at best. Briggs was particularly proud of his work on the Scientific and Technical Committee, which was set up, at Evatt’s suggestion, as a way of circumventing the initial deadlock. Its role was to report on the technical feasibility of control systems, steering away from any broader ‘political’ questions. By holding a number of informal working group meetings, the scientists were able to avoid much of the parochialism that had dogged the early stages of the UNAEC. As a result they succeeded in producing a report that was acceptable to all the member countries. ‘I can claim to have taken a considerable part in determining the form + a good part of the details of the report’, Briggs wrote, obviously chuffed.30 Of course, the report did little to overcome the fundamental conflict between the USA and the USSR, but it provided a solid basis for the discussions, and served as an example of what could be achieved by an impartial approach to the issues at hand. George Briggs never saw himself as a diplomat, nor a policy-maker. He was a scientist, and it was as a scientist that he believed he was able to make a useful contribution to the UNAEC’s work. The success of the Scientific and Technical Committee was testament to the important role that scientists could play if let off the political leash. The George Briggs who arrived back in New York towards the end of May 1947, was much more confident and determined than he had been in 1946. With no Evatt or Oliphant to lead the way, Briggs knew that he would have to take on more responsibility in the UNAEC discussions. The UNAEC was no longer front page news, but there was still work to do – detailed technical work to discover just what sort of control system would be possible should the superpowers eventually come to some agreement. It was a challenge that appealed to the methodical physicist, for it offered clear-cut, practical results. Briggs wasted no time in getting down to business. The Australian delegation received very little direction from Canberra, however, it was understood that they would generally follow the US line. Briggs interpreted this policy fairly broadly, using the informal discussion sessions to launch attacks on the faulty arguments contained within the working papers, much to the US delegation’s chagrin. The scientist whose working life was dedicated to precision measurement and the determination of standards railed against the imprecise posturings and low intellectual standards of the UNAEC deliberations. He cabled Canberra outlining the direction of his thoughts, expecting censure, but determined to stay true to his scientific ideals – ‘if I have to follow US blindly I shall jibe’.37 No censure came, but neither was there affirmation – the instructions from Canberra remained vague. Perhaps the problem was that there were not enough physicists at the UNAEC, Briggs mused, for they currently made ‘a poor team’.38 The USA, in particular, lacked adequate representation, probably because the US physicists realized ‘that the whole business is not being played strictly on the level’.39 Although the USSR had given some indication that it was prepared to compromise, the attitude of the US delegation had hardened – they did not want an agreement. ‘A physicist would be best out of it.’ Perhaps the words came back to him that day, years later, in the Darlinghurst courtroom. This was not a venue for the impartiality he so highly valued. Politics was again intruding on science, but then the boundaries between the two had become so blurred. When did it start? In the war? The Manhattan Project represented a new way of doing science, the innocence was lost. Even as Briggs had held on to the scientific faith at the UNAEC, his organization, the CSIR, had been under attack for harbouring communists. These attacks gained in intensity and hysteria as the conservative parties sought to portray the Labor Government as incapable of dealing with the ‘red menace’. David Rivett, a staunch defender of the freedom of scientific inquiry was smeared as a ‘fellow traveller’. Finally in 1949 the CSIR fell, to be replaced by the more tightly-controlled CSIRO. Science’s relationship with the state had changed. Those halcyon days at the Cavendish would never come again. ‘Did you, when you were at any of these conferences, learn any of the secrets of the Western world in relation to nuclear physics?’ Mr Justice Philp was attempting to discern what potentially dangerous material might have been lurking in Briggs’s office safe. Briggs’s evidence was being heard in camera, not to protect his reputation, but just in case a secret might be let slip. ‘Is nuclear fission still secret,’ asked Mr Justice Ligertwood, ‘or does the average scientist know about it these days?’ The preoccupation with secrets was overwhelming – but what were secrets to a scientist? Physical laws could not be locked in a safe. The UNAEC had stood momentarily against the tide of secrecy, but now all was awash. The Royal Commissioners found Briggs to be ‘a man of high character and integrity’. No secrets had been lost, though Woodward was deemed an ‘unsatisfactory witness’.43 A few years later, 1n 1958, Briggs retired as head of CSIRO’s Division of Physics. For another decade he continued as an Honorary Research Fellow, attempting to finish up his work on the redetermination of the gyro-magnetic ratio of the proton. This research was seen as being so important that the new head of the Division arranged for Briggs to receive a regular honorarium. The world remained a source of wonder, and there were challenges still. In his later life he became concerned about damage to the natural environment. There was much work left to do. George Briggs was a scientist. He made no stunning break-throughs, no discoveries. He did not seek controversy or fame. But for a time he was a player on the world stage, and was, in his own way, the most dangerous of revolutionaries. For George Briggs, physicist, dared to remain true to his calling. There are different kinds of idealism.